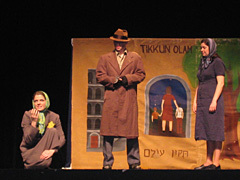 Images from the 2011 production of Life in a Jar. 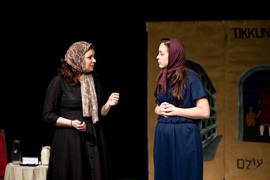 Stella Schafer will direct the McCutcheon High School players in a performance of this Holocaust drama. It's May, 1939. Captain Gustav Schroeder pilots the SS St. Louis, a luxury ocean liner, away from its home port in Hamburg, Germany. His goal: to deliver 937 Jewish refugees out of the hands of Nazism and into the safe port of Havana, Cuba. But when Cuba is the first of several countries t including the United States o deny the refugees safe harbor, a vicious Nazi plot is exposed. This historical drama chronicles the perseverance of the St. Louis' passengers and their struggle to find freedom, safety, and even, love. A heartbreaking story of betrayal and hope in one of history's darkest times. This presentation is open to the public. 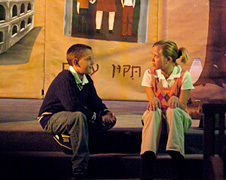 Voluntary donations to the Greater Lafayette Holocaust Remembrance Conference will be appreciated. All donations will be used to support K-12 education in Indiana.